Join us for a different kind of sightseeing tour around the streets of London! 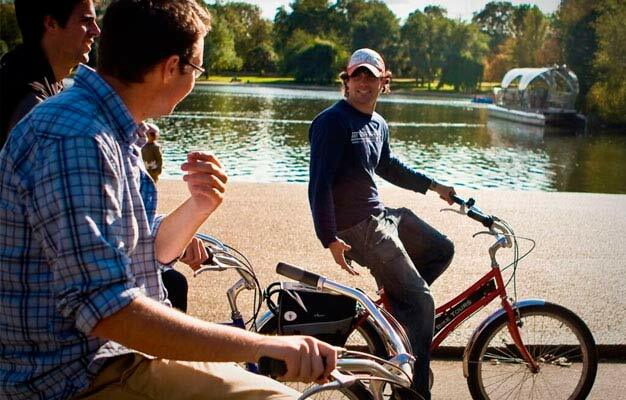 Explore ‘liquid history' and breathtaking urban landscapes by cycling both banks of London's famous river. Learn about legends and facts about a city that has united against Great Plagues, fire, and war, while developing into the cradle of modern civilization and commerce. For lunch, we invite you to wander through the aromas of London's oldest and largest food market (not included) before cycling across Tower Bridge and embarking on an incredible adventure. Tour highlights include: The London Eye, Tower Bridge, St. Paul's Cathedral, The Tower of London, Shakespeare's Globe, London Bridge, Borough Market (only open Thursday, Friday and Saturday), Big Ben, The Monument and Leadenhall Market. The River Thames Bike Tour spends more time on roads than our Royal London Bike Tour. The cycling is not intimidating or strenuous but if you are not a confident cyclist our Royal London Tour will be the better tour for you. Where does the tour start? The tour starts outside Southwark Underground Station (Jubilee Line) where you will see your guide with one of our beach cruiser style bikes and holding a sign. Please be there 15 minutes before your tour starts. The tour finishes at the same place it starts. The tour lasts approx. 4 hours. We run tours rain or shine and have plenty of rain ponchos. We find tours in the rain to be a different kind of fun and an even more fun memory! If you have a reservation and the weather is really bad, you are welcome to reschedule the tour for any other day for up to year. Do we stop for lunch? Yes. On Thursdays, Fridays and Saturdays we stop at Borough market, London's oldest and most atmospheric food market, which has a huge selection of food from around the world. There is also the opportunity to have a pint at a pub. On every other day, you will have the option of cafes, a fish & chip restaurant or a pub. There is a lot more road riding on this tour so you must be confident on a bike. It is not strenuous but is a little bit longer and a touch more intimidating than our Royal London Tour. Yes. You are not compelled by law to wear helmets in the UK, but we have more than enough for everyone so the choice is entirely yours. Are children allowed on this tour? Children are welcome on this tour but should be competent and confident on a bike. Yes, children's tickets are available for children between age 4-18. Children under age 4 are free when accompanied by a paying adult. The tour departs at 10:30 AM.